Jiri Everest base camp trekking in one of the popular and easier trekking trail in Everest region. Jiri Everest base camp trekking offers superb Himalayan scenery including the Mount Everest 8848m, Mount Lhotse 8516m, Mount Nuptse 7855m, Mount Pumori 7145m, Mount Amadablam 6856m, Mount Thamserku 6723m, mount Kantega 6779m, Mt. Kusum Khangaru 6367m, Gauri shanker himal 7145m , Number Himal 6988m, Island peak 6179m etc . Lukla Everest base camp kala pattar trekking can be done with in 3-4 weeks from Jiri. From Jiri trekkers can be done long route trekking via Gokyo Ri Cho la pass and finally in Everest base camp. Himalaya Journey Trekking & Expedition professional will arrange the Everest region trekking according to trekkers holiday schedule and wish. 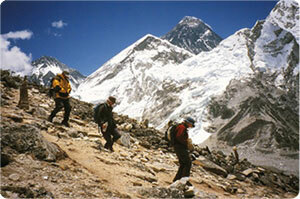 Jiri Everest Base Camp is breathtaking and requires a good walking experience and a good physical health codition. Jiri Everest base camp trekking is very interesting walking with its panoramic Everest Himalayan view through the famous Sherpa village of Namche Bazaar, Tengboche Buddhist Monastery, Khunde Khumjung etc. Settlement of mixed ethnic group Brahman, Chhetri, Magar, Tamang in the low land and Sherpa in highland of Solukhumbu Everest region. If you have ever longed to set eyes on our highest summit then this exciting trek in the Everest region gives you the opportunity to fulfill a dream, while taking in some of the most breathtaking scenery in the Himalayas. Ever since the days of early climbing expeditions, the 8848m mountain has had a lure of its own, drawing climbers to scale it and trekkers to gaze on its icy faces. Naturally, the trail to the base camp of the mountain has become one of the most popular trekking routes in Nepal, yet few people return from the trek unmoved by the experience of being right in among the highest peaks in the world. Jiri to Everest base camp trek cover low land from Jiri to highland Kalapathar 5545m. Highest access of the trek: Kalapattar 5545m & Everest base camp 5400. Splendid breath taking place: Everest region trekking , Everest base camp & Kala pattar. Day 01: Arrival in Katmandu (1334m), transfer Hotel, Jiri to Everest base camp trekking briefing with officially arrangements.overnight at kathmandu. Day 03: Jiri trek to Deurali (2250m). Day 04: Deurali trek to Sete (2575m). Day 05: Sete trek to Junbesi (2675m). Day 07: Nunthala trek to Puyan (2830m). Day 08: Puyan trek to Phakding (2830m). Day 09: Phakding trek to Namche Bazaar (3480m). Day 15: Early in the morning hike up to kala pattar 5545m for superb Himalayan scenery including Mt. Everest( 8848m) , Mt.Lhotse, (8516n) Mt. Nuptse, (7855m), Mt.Pumori 7161m,Mt. Changaste 7550m, Mt.Amadablam (6856m), Mt. Thamserku ( 6723m) , Mt. Kantega (6979m), Mt. Kusum Khangaru ( 6367m) , Mt.Kongde (6011m), Mt. Tawache peak ( 6367 m) , Mt. Cholaste (6335m), back to Gorakshep, breakfast at Gorakshep, continue trek to Dingboche 4350m. overnight at Dingboche. Day 19: Lukla by flight back to Kathmandu. Day 20: After breakfast, our tour guide will take to for historical monuments sightseeing in kathmandu valley such as Boudhhanath : visit Bodhnath Stupa, one of the biggest Buddhist shrines in the world, where we observe Buddhist monks in prayer in the monasteries surrounding the stupa than visit Pashupatinath: the most famous Hindu temple in the country, located on the banks of the holy Bagmati River. Here you see Hindu holy men (sadhus) meditating, pilgrims bathing and occasionally funeral pyres burning on the ghats. Bhaktapur: you will enjoy with different spectacular Himalayan scenery , old architecture, 55 windows, Pottry farm, king curd and old style primitive houses. Kathmandu durbar square: you will enjoy with different Hindus Temple, Goddes Kumari, legend of kathmadu valley. Monkey temple(swyambhunath): you will enjoy with Budhhist stupa from where you will see whole kathmandu valley view including the Himalayan views ,Patan Dubare square: Patan city is the temple city of Nepal where you will see the many temple,Mahabudhha , Golden temple etc and in the evening farewell dinner in Nepalese Restaurant, overnight at kathmandu in Hotel..
Day 21: After breakfast, relaxing or shopping with own activities than Himalaya Journey Treks & Expedition's reprensatative will drop to international airport for onward destination.